The Chromatrap® ChIP-seq kit uses solid-state technology in parallel with high-throughput sequencing to deliver a streamlined ChIP-seq protocol from small cell numbers and low chromatin concentrations to investigate the epigenetic landscape. Specifically adapted for broader chromatin concentrations, Chromatrap ChIP-seq combines the dynamic range of Chromatrap with the downstream analysis power of deep sequencing. The new kit allows users to perform up to 24 ChIP assays from cell collection through to immunoprecipitation, including up to 10 chromatin sample preparations. 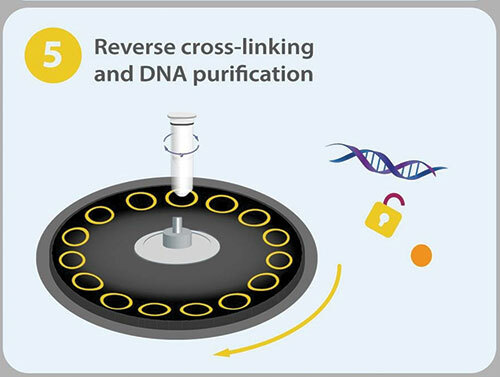 The kit provides all the major components required for performing ChIP assays, to obtain high-quality DNA for next-generation sequencing library preparation. With the Chromatrap ChIP-seq kit you can sequence from as little as 1–50 μg of chromatin and perform up to 10 library preparations form a single IP. A complete assay can be completed in just two days.